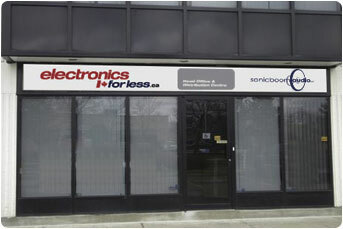 Electronicsforless.ca is one Canadian online store that I've never even heard of before in my life. At least with online stores like Newegg.ca or Tigerdirect.ca you may have heard of them (or seen their ads) if you do some internet research. Electronics For Less Canada For Real? So again my "Hmmm, is this a legit web site? "-sense was tingling—especially when the prices (depends on what is on sale) seem too good to be true...And it gets even better: free shipping on top of that! But, I'm glad to report that it's totally legit. Purchased Monday night, and it arrived on Thursday morning (shipping from Richmond Hill, Ontario to Montreal, Quebec). A great deal and convenient too (don't have to drive around and haul it home)...So, I'm glad that I went for it. Another place to add to my list of online stores to check out for electronics deals. So if you are wondering what I bought from them it was the Pioneer Elite VSX-30 Receiver. The Pioneer Canada web site lists it at $799 MSRP, compared to the $550 in the United States. Unfortunately this price difference is pretty normal for Canadians, but at Electronics For Less I was able to pick it up at $599 with free shipping which made it acceptable. So that's what made me give them a try, and I'm glad I did. Just mentioning what I bought from Electronicsforless.ca, the Pioneer Elite VSX-30. A good receiver that is still doing the job for me two years later.